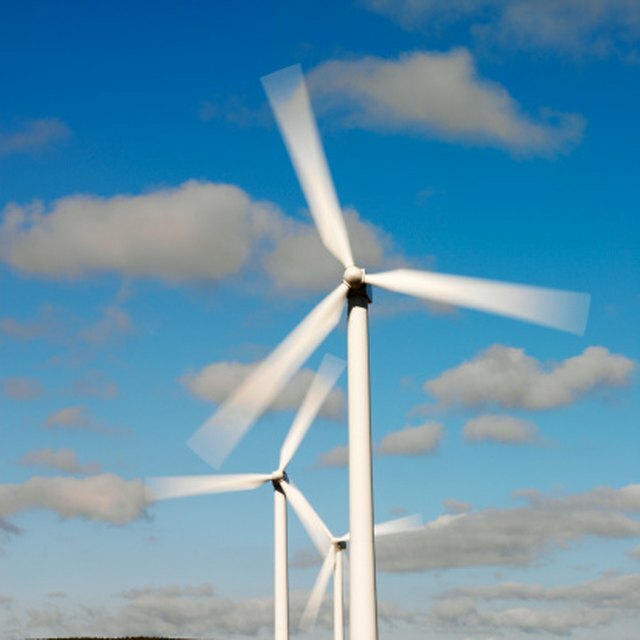 A wind farm can turn the air over your property into a source of extra cash. Turbines catch the flow of air and use it to generate energy. You can lease the land to an energy company for a fee, or set up your own power-generating windmills and sell the power to the utilities. Having strong winds around your land doesn't guarantee a wind farm will work. The National Wind Watch website says it takes about 60 acres to generate one megawatt of power. A small fraction of that land is occupied by equipment, leaving the rest as a buffer zone to ensure nothing obstructs the wind. If there's a wind power company in your area, it may contact you about surveying your land for leasing, or you can initiate contact yourself. To close the deal, you'll have to agree to not only host the windmills but also avoid anything that will impair the wind flow. This could affect building on your land or even the height of trees. Why Is Wind a Renewable Resource? How do I Calculate Gwh/Year? A fixed payment for the acreage. A fixed payment based on the energy generated. Royalty payments based on the revenue generated. Any combination of the different methods. National Wind Watch says most leases are based on gross revenue generated per turbine, typically 3 to 5 percent of gross earnings. Leases often include a minimum fixed payment that applies even when the turbines aren't generating. Some leases allow a higher royalty down the road, after the power company has paid off its initial costs. Leases can be incredibly complex. For example, the way the lease defines gross revenue will have a big impact on your income. Don't hesitate to hire legal help if you need it. The lease can include other types of payments, such as compensation for any acreage you have to take out of production if you run a farm, for example. Does your site have enough wind for a farm — at least 11 to 13 miles per hour annual average speed? Are you close to a transmission line? The closer the existing infrastructure is, the less the cost of using your wind power. Is the local power company willing to make a long-term commitment to buy your energy? Are there obstacles to a successful wind farm such as raptors flying through the area, local aircraft, or land and access roads that can't support the industrial equipment used to build the turbine towers? The amount you can earn depends on the current utility market in your area. Average wind power rates in 2014 were a record low of 2.5 cents per kilowatt hour. As this makes wind power more competitive, it increases utilities' interest in buying from wind farms. If you have a small operation generating more power than you need, you may be able to save some money by net metering. A net meter is a two-way meter set up to track not only your power use but also any extra power you feed into the grid. The extra power is taken off your bill. Contact your utility to determine if this is feasible. The federal business energy investment tax credit allows you to write off 30 percent of your expenses for wind turbines. The deduction comes off your taxes, not your taxable income. The maximum credit is $4,000, but the government lifts the cap for turbines of 100 kilowatts or less. The turbines must meet quality and efficiency standards and follow the IRS rules for the credit. The credit expires at the end of 2016, although Congress can extend it. Check the IRS website for the most current information on credits.